THERE ARE TWO STICKERS ON THE BACK, ONE FROM NEW YORK FRAME AND PICTURE COMPANY, ONE FROM CAMELOT RECORD STORE AND SOME SMALL WRITING. SOME OF THE LABELS ARE BLUE AND SOME ARE BLACK. A FEW OF THE AWARDS HAVE BOTH LABELS, THE BLACK LABEL IS PLACED OVER THE BLUE LABEL. YOU CAN PEEL THE CAMELOT LABEL OFF BUT IT LEAVES A MARK. A Few Of These Awards Have The Hanging Cord On The Back Removed And They Have Been Replaced With A Saw Tooth Hanger. The Holes Where The Hanging Was Originally Attached To The Frame Are Still There. You Could Replace The Hanging Cord Easily Or Leave The Saw Tooth Hanger. THE ELVIS AWARDS HAVE DAMAGED FRAMING PAPER ON THE BACK. THERE ARE INDENTS FROM IMPROPER HANGING AND SOME OPENING OF THE ALONG THE BACK EDGES. These Are Not It. Most Are 5 Out Of 10s But That Is Also Why We Started Them Out So Inexpensive. We Also Want To Make It Clear, The Doors Never Owned This Award. Often People Ask If There Was Any Chance And These Are Commercial Copies Of These Awards Meant For Retail Display. There Is No Chance That Anyone In Or Related To The Doors EVER Owned This. We Want To Be Honest. The Writing On The Back Was In Pencil And We Have Erased As Much As We Can But If You Hold Some Of The Backs Up To The Light, You Can See The Pencil Marking Indents. 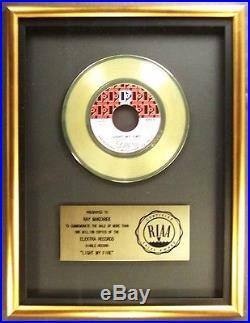 The Award Pictured Is Presented To Ray Manzarek. These Awards Have So Many Reflective Angles/Surfaces It Is Almost Impossible To Get A Perfect Photo. THIS AWARD MEASURES 13 X 17. A: No, We Have Quite A Few Awards. Q: What Are The Frames Made Of? A: They Are Wooden Frames. Please View Photo(s) So That You Are Able To See What Color Frame Was Used. Q: Was This Award Ever Personally Owned Or Handled By The. This Award Was NEVER Owned Or Handled By The Doors. Q: Were The Awards Framed In Real Glass Or Plastic? A: The Large Awards (X2 Platinum And Larger) Were Made With High Quality Plexi-Glass And The Single LPs And 45s Are Glass. Q: Were The Records In The Awards Painted Gold Or Platinum? A: No, The Records Have Been Electroplated Gold or Platinum. They Are Very Shinny And Reflective. Q: Can The Awards Be Customized To Me Or Someone Else? A: No, It Would Destroy The Back Of The Award And The Brass Plaque Would Have To Be Stripped And Redone. A: Yes We Do When We Can. We Will Do Our Best. Can’t Afford The Record Award(s) That You Want Right Now? The item “The Doors Light My Fire 45 Gold RIAA Record Award Elektra Records XMAS SALE” is in sale since Sunday, December 11, 2016. This item is in the category “Entertainment Memorabilia\Music Memorabilia\Rock & Pop\Artists D\Doors\Other Doors Memorabilia”. The seller is “recordawardworldeast” and is located in Seminole, Florida. This item can be shipped worldwide.